I wanted to share with you a new invitation I finished up last night. Boy was this one a struggle. It was for a 30 year old man's surprise birthday. First I don't do adult cards very often. Kid and baby themes are my comfort zone and then to top it all off a GUY card! Phew. Well after many false starts here is the finished product. I like how the sombrero turned out. It is from a sketch I drew last night and then programed into my Silhouette. The moustache adds character, but my FAVORITE part about this card is the awesome Bazzil textured cardstock I used for the numbers. It looks like cactus! I even drew in little spines with a black marker. Definitely fitting the theme. Great design - I especially like the moustache! Great job! I bet he will love it! Oh this is so fun! I love the sombrero and mustache. These are wonderful! How many do you have to make? Only 12 of these for the surprise party. I may add them to my shop though. I just love that cactus and them moustache. hey how can i buy some of these?? do u sell? Hi Rashmi, Yes I do sell. Stop by my shop on Etsy www.jillybeardesigns.etsy.com You can contact me through there to set up an order if you like. 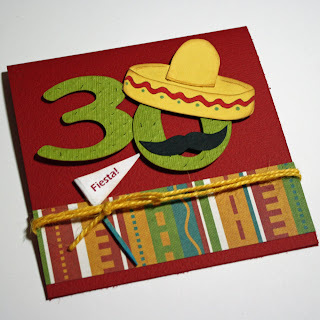 These 30th Birthday Invitations are having nice colors and I just love the design as well. Keep sharing your work here. My hubby will turn 30 years old and this is why I am planning a memorable party for him. He loves golf so I think that a golf party would be just perfect for the day. Hopefully will come across a suitable event venue Atlanta for this bash.